JNN 19 Mar 2014 Delhi : With the next general elections due in April and May in India, Muslim voters in the world’s biggest democracy have found themselves in a dilemma, with opinion polls showing much criticized Narendra Modi ahead of his rivals as the likely coming premier. “We want to become part of the system in India. 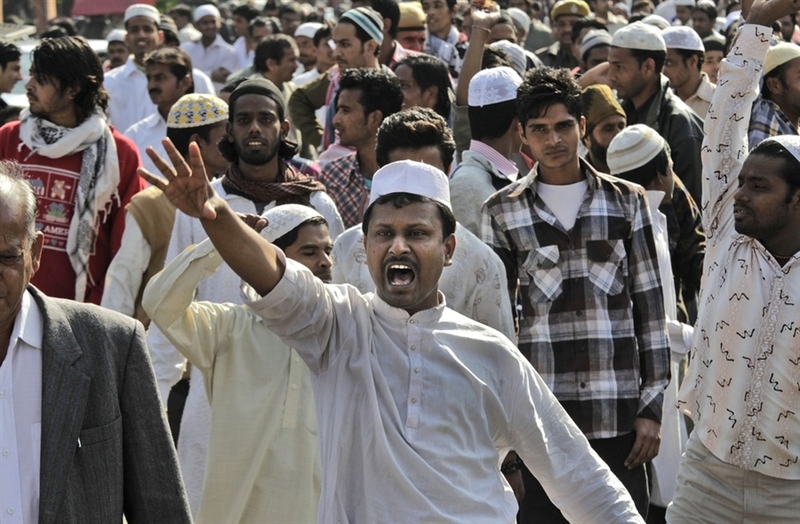 But Muslims have been given an electoral image in polls,” told Anis Ibrahim, a student at Kanpur city to Onislam.net. “We are treated as a vote bank in India. Political parties talk about Muslims only when elections approach,” he added. Tensions between Muslims and Modi, the three term chief minister of India’s Gujarat state, date back to 2002 massacre of Muslims. More than 2,000 Muslims were hacked and burnt to death in Gujarat in 2002 by Hindu mobs after Hindu pilgrims died in a train fire, which was first blamed on Muslims but turned accidental due to a later inquiry. Several investigations at the state and federal levels accused police of failing to protect Muslims under orders from Modi and his aides, fanning one of the worst instances of sectarian violence in India. Choosing between Modi and other politicians, Muslims have been raising alarms about how the Hindu politician will treat the Muslim religious minority. The Muslim concerns were coupled with a feeling of disappointment surrounding different politicians in India who have long failed Muslims. “As citizens of this country, we also suffer from corruption, unemployment and other issues,” Khaliq Ahmed, another student of Lucknow, said. Setting election from April 7 to May 12, India is preparing for an energetic election campaign. Going up dramatically by almost a hundred million since 2009, 815 million voters are eligible to vote to elect 543 lawmakers. For the looming elections, setting election agenda was an easy task for Muslims, putting only one goal to stop the Bharatiya Janata Party (BJP) prime ministerial candidate Narendra Modi from becoming India’s next prime minister. They know that they will not be safe under Narendra Modi and there is every chance that Indian Muslims may be treated like a second class citizen in their own country. “For Muslims immediate goal is security. Like the proverb goes ‘Jan Hai to Jahan Hai’ (If there is life, then there is the world),” said Anam Saleh, a teen excited to vote for the first time in forthcoming elections. Similar concerns were shared by Mufti Abdul Razzaq, vice-president of influential socio-political organization of scholars; Jamiat Ulema Hind. “We cannot trust Narendra Modi,” he told Onislam.net. But Muslim scholar and political analyst Rasheed Kidwai shares a different view. “Narendra Modi’s rise as future prime minister of India and its impact on Muslims has more hype than substance,” Rasheed Kidwai, who has written a book “Sonia-a biography” on the life of Congress president Sonia Gandhi, told Onislam.net. “In coalition politics, Modi’s personal agenda will have severe limitations. Liberals and civil rights activists and citizens at large share equal concern to check rise of any extreme element in society. “What remains to be seen is how much Modi would mellow down to accommodate multi-culturalism and multi-pluralism and what kind of model he would come forward with. Indian democracy has tremendous resilience,” he added. Losing confidence in ruling Congress party, which had promised everything to them but never delivered, Muslims seem with no much options in ensuing elections. The religious minority remains as one of the most neglected communities in India in terms of employment, poverty, education and health. It is believed that the Congress could face the biggest defeat of its history in the coming elections. Yet, it is believed that Muslims in India are going to play a major role in 120-150 constituencies for which elections will be held in the next two months. The majority of those seats fall in the state of Uttar Pradesh and Bihar. But the strategy Muslims are going to adopt for this election is that they are no more supporting any one political party. They will now vote tactically to keep BJP or Modi out of power. This entry was posted in Asia Pacific and tagged 2014, india, Indian Election, indian muslims, Narendra Modi. Bookmark the permalink. THERE SHOULD BE NO DOUBT, DILEMMA OR CONFUSION IN THE MINDS OF A TRUE BELIEVING MUSLIM THAT ANY HOBNOBBING WITH NA-MO OR ANY OF THEIR PARTY CANDIDATE, VOTING, SUPPORTING, GREETING , GARLANDING HUGGING OR EVEN EXCHANGE OF SALAAMS IS AN ACT AS ABNOXIOUS AS KUFR , A GUNAH AND AN ACT OF TREASON TO THE COMMUNITY . RASOOL E KAREEM (saaws) AND ALLAH WILL NEVER BE PLEASED WITH ANY SUCH EVIL GHADDAR OF THE COMMUNITY .THOSE WHO ARE IN THAT PARTY SHOULD BE SOCIALLY BOYCOTTED AND NO RELATIONSHIP SHOULD BE KEPT WITH THEM. OUR MESSAGE IS FOR ALL SHIA, SUNNI, WAHABI SALAFI,DEOBANDI,BARELVI, IGNORE THIS CALL AND FEAR DEATH ALL THE REST OF YOUR LIFE & MOST LIKELY FACE JAHANNUM IN YOUR HEREAFTER.INFORM ALL YOUR FRIENDS KITHS AND KINS AND ALL THE DEAR ONES .